I am the founding guitarist and singer in Buffalo Tom, along with Chris Colbourn and Tom Maginnis. The band was formed in 1986 at the University of Massachusetts at Amherst. You can read about the band at BuffaloTom.com, Allmusic.com, and our Facebook page. This site is to spotlight the solo projects, the writings, the cover songs, and other larks. Starting around late 2008/early 2009, I started a Cover of the Week project, which after about 100 selections, dwindled into the less-regular Cover of the Whenever project. You can start weeding through them via the menus on the left. Starting in early 2012 (the time of this writing), I switched the formate/template of this site and am embarking on a web-release of a work in process, a solo album. My intention is to release the mostly/completely finished tracks as they get to an acceptable state. But some will require a full band, for which I will need to hire musicians and a studio. You can listen and download to the music here for free, but I would appreciate any donations you can make via the PayPal button to the left, which will allow me to offset my costs. I don’t need to do a Kickstarter Campaign to get going, But those who send me — let’s say $12 or more — will likely get a signed, remixed, high quality CD and download version of the project once it is complete. I say “likely” because I will need enough people to sign on to justify printing up the CDs. But anyone who gives $5 (Louis C.K. has set the pricing) or more will get to download the whole thing later in high quality audio file format. 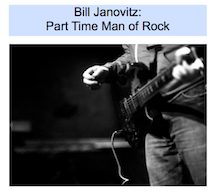 You can email me at: janovitz.bill@gmail.com to give me the head’s up that you’re one of those donors. PayPal will send me the emails/info for each donors anyway. I will send notices to those who have donated when the project comes together. To be clear, I am only accepting donations for the original music. I offer the covers only as a fan of the songs, with the idea that if you enjoy them, you make a donation to charity. I had suggested the Foundation to Be Named Later (near and dear to my heart) and Human Rights Watch, near and dear to my late uncle’s heart (his story is told here). But it is your call.